"I am a ginormous fan," judge Randy Jackson told the 20-year-old gospel singer. 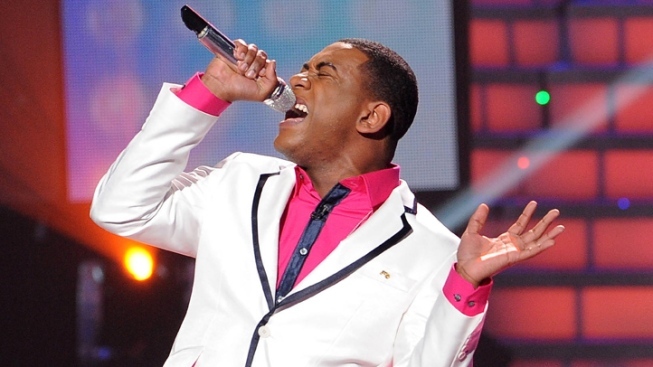 Joshua Ledet earned another pair of standing ovations on "American Idol." The powerful 20-year-old gospel singer from Westlake, La., got the Fox talent contest's judges on their feet again Wednesday after his energetic take on Queen's "Crazy Little Thing Called Love" and restrained rendition of India.Arie's "Ready for Love." The finalists were tasked with tackling both a Queen classic and a song of their own choosing. "Is it bad for me to say Joshua's part of the show is my favorite part of the show?" beamed Jennifer Lopez. Skylar Laine, the 18-year-old country rocker from Brandon, Miss., who impressed the panel with "The Show Must Go On" and Jason Aldean's "Tattoos on This Town," joked that Ledet earned his 12th standing ovation of the season. Laine herself wasn't lacking for fans. Steven Tyler called her country interpretation of the Queen ballad "over the top." "I am a ginormous fan," said Randy Jackson. But Jackson and Tyler didn't love Elise Testone's bold selection of Jimi Hendrix's "Bold as Love." Tyler warned the rockin' 28-year-old teacher from Charleston, S.C., that while it warmed his heart for her to do Hendrix, she's "gotta do songs that people know." Lopez issued a similar warning to 21-year-old pawn shop worker Phillip Phillips of Leesburg, Ga.
"I need you to do songs that are gonna get you on that last show so you can win," Lopez demanded after Phillips' tackled the Dave Matthews Band's frenetic track "The Stone." Jackson disagreed though, telling the growly blues-inspired crooner, who earlier earned rave reviews for Queen's "Fat Bottomed Girls," that "you showed your true colors again." After delivering a truncated "Bohemian Rhapsody," 16-year-old Jessica Sanchez of San Diego struck an emotional chord with Luther Vandross' "Dance With My Father," which she dedicated to her soldier father. Hollie Cavanagh, the soaring 18-year-old singer from McKinney, Texas, also tugged at the judges' heartstrings with Queen's "Save Me" and Miley Cyrus' "The Climb." "It doesn't matter what kind of accent you got, you sing a song like it's going out of style," Tyler told the English-born vocalist. Before their individual performances, the top six finalists were medley accompanied by guitarist Brian May and drummer Roger Taylor for a Queen medley. One of the singers will be dismissed Thursday.